Let It Be by The Beatles is such a great song for a singalong. Everybody knows it, though the volume always goes up for the chorus. It’s quite high for the voice, so don’t be shy with. It was the title track of their last album in 1970 and there’s a great film of them playing on the rooftop of Abbey Road Studios. Now let’s be clear – this is really a piano song. You can see on the video here that George Harrison only plays solo sections and single note parts largely in unison with the bass part. So the guitar chords shown here are just trying to immitate the chords played at the piano. The other way this video is useful is that you can see the way Paul McCartney is playing the rhythm – it varies a lot. 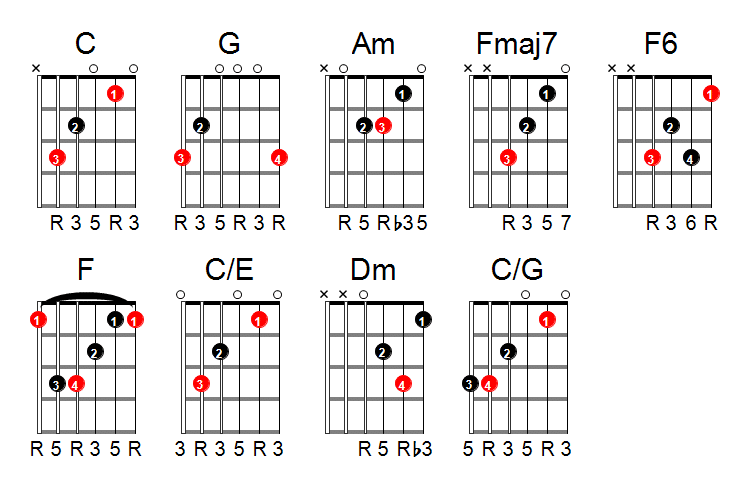 So here you’ll see a suggested strum pattern, but you’ll want to vary it. Just keep you hand swinging up and down and it will stay in time. The other thing to notice in the video is that there’s a lot of improvisation going on in the rhythm but also in the guitar solos. They’re not the same as the version on the album, similar, but not the same. So George will have had some ideas in mind that he was playing around with. Notice also that Paul either forgot the words for the last verse or was mucking about! And you can hear that this recording predates autotune. There are quite a lot of chord shapes for this song. We’ve included the voicings – the numbers under the diagrams represent the notes from the major scale starting from the red root note. As always, you can just ignore all the extras (6ths, 7ths etc) and just play the straight major or minor chord if you want to just play a simple version. So instead of Fmaj7 you can just play F if you like. There are 4 beats to the bar in this piece. The strum pattern is in semiquavers. This chord progression and its strum pattern happens at the end of lines 2 and 4 of every verse. This is the bit where the whole band plays together – like an orchestral tutti.